The furniture retailer wanted its annual managers' seminar, organised by Meet and Potato, to have a theme of adventure and exploration. Furniture retailer Dunelm worked with agency Meet and Potato to organise its annual managers’ seminar for 550 delegates. The theme of the event was to be ‘adventure and exploration’ and the chosen venue was the Ricoh Arena in Coventry. Using the theme of adventure and exploration, the event was intended to be a ‘journey of discovery’, as delegates went on a trip around the world. This narrative was told through animation, creative video, live interviews, panel discussions and presentations supported by slick PowerPoint design, to keep delegates engaged and entertained throughout. Arriving at ‘passport control’, delegates collected their itinerary and travel documents for the two-day adventure. 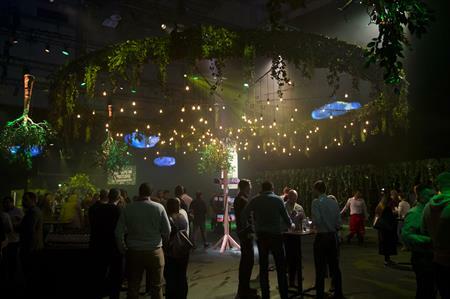 They were asked to trek into The Clearing, a luscious, green, foliage strewn space with inverted trees, glowing clouds and pendant bulb lighting creating an atmospheric glow. Soon after refreshments had been served, a rumble of thunder could be heard in the distance and a strong breeze began to blow. Delegates were ushered through to Base Camp by Sherpas to take shelter. After another ripple of lightning and snow projections, the room went black and a video began on a huge eight-metre screen. The video, narrated by Sir Ranulph Fiennes, followed a journey through four environments including Everest, the Sahara Desert, Antarctica and the Amazon. Then business goals, strategy and targets came next, along with breakout room in one of four environments introduced in the video. The adventure theme continued into the evening, with an Aurora Borealis-inspired gala dinner and awards ceremony. Creative lighting was used to create a mountain-landscape background. Darren Bulmer, Dunelm project manager said: "It was another brilliant event, our best managers seminar yet. Meet & Potato have delivered at every stage of the process. Thanks again to everyone involved – it was a true team effort!"